Secure bike parking encourages bike ridership. Not knowing if there will be a safe place to lock up can mean the difference between riding your bike or choosing some other means of transport. This year, thanks to a generous donation from People for Bikes and a partnership with Baltimore City Department of Transportation, we are launching a campaign to install 100 more bike racks in places that need them the most before Fall 2016. Baltimore City has been offering free bike racks and installation for a few years, but the request process was clunky, inefficient and frequently led to poor communication and really long wait times. Bikemore has created an easy to use, mobile friendly site that will simplify the request process. By taking the lead on submissions, we can also track the time DOT takes to install the racks and create a layer of accountability. Our plan is that no one will have to wait more than six weeks to see their rack installed. Additionally, we want to make sure that these racks are made available to the places and businesses that would not otherwise be able to afford a rack. Businesses of all types should note that if you purchase your own rack, you can also request the city install it for a small fee. This fee--depending on the surface and demand may even be waived. Model an efficient, mobile responsive request system. Launch a summer long marketing campaign to ensure that businesses and schools in neighborhoods underserved by bike parking and DOT outreach have access to the free racks. Educate residents on effective bike racks and locking techniques that deter theft. Advocate for city bike rack requests to be integrated into the 311 system by Fall 2016. Is there a business or school you frequent that you wish had better bike parking? When visiting, direct the owner of the business to the form using your smart phone. (our east to remember URL? bikemore.net/bike-parking) Help them complete the application. It’s important that the point of contact on the request form is the person that has the decision making powers on the property where the rack is requested. Share on social media. The more people that know about this process the better! Join our bike parking STREET TEAM. We will be scheduling a time later this summer to canvass or call business or schools in need of bike parking and offering to assist them with completing the request form. Interested in learning the proper way to lock a bike, and ensuring you selecting the most secure rack to lock to? We love this article from our friends at Sacramento Area Bicycle Advocates. Not all bike racks are equal, so educate yourself on which ones are best, and let's get some BETTER BIKE PARKING for Baltimore! DuBurns Arena – 1301 S. Ellwood Ave.
Long & Foster – 1210 Light St.
Messiah Lutheran Church – 1035 S. Potomac St.
Beadazzle – 501 N. Charles St.
Federal Hill – 1011 Light St.
Federal Hill Eye Care – 1029 Light St.
City Limits – 1700 E. Fort Ave. Ace Hardware – 1022 Binney St.
Peters Inn – 504 S. Ann St.
Smaltimore – 2522 Fait Ave. 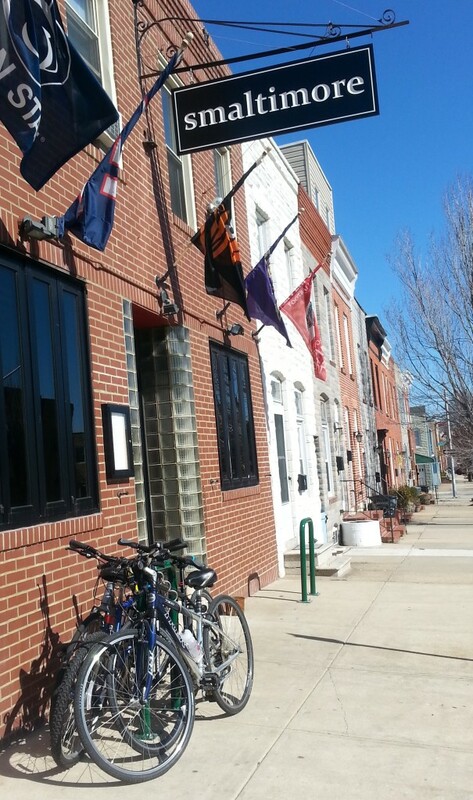 Fork & Wrench – 2322 Boston St.
A big thanks to B'more Bikes for the list. Remember when the bike racks at Penn Station were undergoing construction, wrapped in police tape? Well, we have some good news. Gone is the police tape, and the racks are ready to go! After this hellacious snow storm is done for good, make sure you head on over and take advantage. Like the other bike racks at Penn Station, I'm sure these babies will be in high demand. At long last, the Baltimore City Department of Transportation has bike racks and ready to be installed across Baltimore City. It's pretty straightforward to request one. Just email Caitlin Doolin with the address and specific description of where they want the rack(s) to go. Make sure you spread the word, especially to business owners around the city. Let's try to get these things popping up all over the place throughout the year and beyond! Make sure you check out details of the new bike canopy at Penn Station at the always-fabulous Baltimore Spokes.